So far we have shown you how you can track web pages and how you can send custom data when doing that. Today, we introduce two features that let you modify data server-side, that is once it arrives at the Adobe collection servers. Some things can only be done server-side because they rely on information that is only available at that point. Release cycles – if you cannot modify your client-side tracking for some reason, you might be able to “patch it up” server-side for the time being. Let’s take a step back and look at the whole “lifecycle” of data. 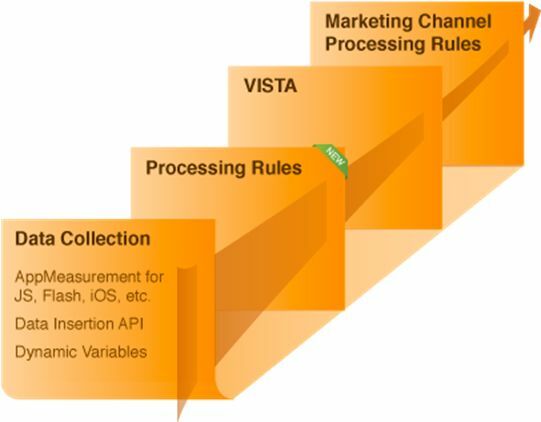 Processing Rules and VISTA can modify data, that is the important point here. They are similar in that they work on hit-level. They have no memory and no ability to look back or forward in time (use information from other hits). Both can assign values to the “variables” that you sent in, and both can add data into “variables” you did not send. Both allow you to define conditions on when to do so. Something like if s.pageName is 'Homepage' set s.prop45 = 'Index' can be done with both, Processing Rules and VISTA Rules. Processing Rules are defined in the UI by end users while VISTA Rules are written in a dialect of C by the Engineering Services team. That means that VISTA Rules come with a cost. Processing Rules can access ‘Context Data Variables’, VISTA Rules can not. VISTA Rules are more powerful. They can copy hits to other report suites and change every aspect of a hit, even exclude it from processing. VISTA Rules have access to geo-location lookup as well as mobile meta data, Processing Rules don’t. Generally speaking, VISTA Rules are a powerful and more long-term tool, while Processing Rules are mostly used to patch your deployment for a short time. As a developer, you would rarely come into contact with either Processing Rules or VISTA Rules. The former should be administered by the end user, i.e. your friendly marketer. VISTA Rules are built and deployed by the Adobe Engineering Services team, not you. It is nevertheless important that you know a) that they exist and b) that they can modify the data sent into the Analytics platform! Nothing is more irritating than debugging without knowing what the system can do. We’ll explain both in more detail in separate postings. Good note however I don’t believe processing rules are only temporary solutions or only used for temp bug fixing. For example It is possible to use Adobe Tag Manager to set all your global plug-ins and variables and at the same time use the Context Data Variables + Processing Rules to enable tracking on websites. Context Data will remove the barriers between you and developers, no more discussions about eVar and props, simply they don’t need to know. Processing Rules as an enabler for Context Data Variables are indeed not temporary or a patch. We’ll get to them soon!